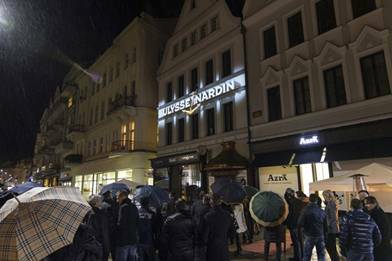 Home » instyle » Luxury Swiss Watch Manufacturer Ulysse Nardin Opens a Boutique in Karlovy Vary, Czech Republic. 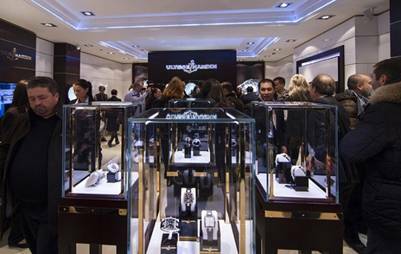 Luxury Swiss Watch Manufacturer Ulysse Nardin Opens a Boutique in Karlovy Vary, Czech Republic. 2012, November 29th – Karlovy Vary, Czech Republic – Luxury Swiss watch manufacturer Ulysse Nardin, the leader in timepiece invention and innovation, announced the opening of a mono-brand boutique in Karlovy Vary. The 100 square-meters boutique features a collection of over 100 of its finest timepieces, including three models from the Limited Edition Boutique Collection, all presented in a sophisticated, nautical inspired setting. Among VIP’s, Mr. Patrik Hoffmann, CEO of Ulysse Nardin with Mr. Fikret Osmanovic (owner of the Ulysse Nardin Boutique) and Mrs. Gabriela Partyšová (moderator TV Prima, Czech Republic) attended the ribbon cutting ceremony. The Boutique Collection includes the Blue Toro, the Freak Tourbillon Platinum, and the Blue Executive Dual Time. The Blue Toro is a limited edition certified chronometer with a self-winding perpetual calendar that is conscious of leap years, so it doesn’t have to be reset. The Freak Tourbillon Platinum pays tribute to the original Freak’s pioneering spirit by expanding its use of silicium and taking its tourbillon to new heights. It showcases unrivalled advancements in technology, materials and design and is limited to 10 pieces. The Blue Executive Dual Time is comprised of a patented Dual Time system with pushers that instantly adjust the hour hand to a different time zone while the home time indicator continues its’ 24 hour cycle.